After all the activity of Ruth’s wedding, I had a lovely two days planned at a quiet country B&B with free wifi so that I could seriously work on my assignment, the draft of which is due next Monday. For my last assignment, the most I could manage for the draft was an introduction and a couple of section headings so this time I wanted to get the full assignment written so I could take advantage of the feedback and really make sure I don’t overshoot effort wise with another B. This time, I want that C! Unfortunately the B&B only just has wifi. Basically, you get half a bar if you stand on one leg at the back of the stairs on the first floor. I’ve also been told that right next to the tv where the grumpy farmer is watching his team lose at gaelic football in the lounge is a good spot for another half a bar. A full bar is absolutely out of the question. I spent twenty minutes trying to send one email and gave up. I decided instead to head into town to see how Kinvara rates compared to Whitstable as a place to study your masters. As you know, I found Whitstable and Seasalter very conducive to studying. Kinvara was not so well accommodating. It was Sunday morning which may have had something to do with it, but most of the cafés were closed and the one pub I could find that was operating didn’t have wifi. I asked if they could recommend a place with wifi and the only suggestion they had was a nearby café called ‘The Junction’. I drove around for a while trying to find this place without any luck. I went back and asked again and this time the girl took me outside and pointed out where to go to ‘The Junction’ and I realised there had been some language confusion. She was pointing to a café called ‘The Gentian’! This café was packed to the hilt with tourists who had flocked there to use the internet. And it was very noisy but I persisted anyway. The cakes were delicious! 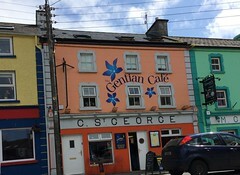 I ran this morning in the rain and then hightailed it back to ‘The Gentian’ for a chat with a masters buddy. Again, it was packed and noisy so our conversation was difficult at times to understand despite my headphones. I’m now wondering how much more tea I can possibly fit in before I am forced to leave and free up a table for the hordes of locals and tourists who are desperate to use the only free and fast wifi in town. I’m also too scared to go to the toilet in case they give my table away. This is causing me to be quite uncomfortable and is adding to the not ideal conditions to be attempting to work under. I just went to pay for my two pots of tea, scone, muffin and soup that I’ve used to justify my possession of a table in the café for so long and the landlady from my B&B appeared and insisted on paying my bill for me! How lovely is that! Oh Ireland – you are too nice!